When Did The Roles Reverse? Your journey of caring for aging parents has begun. You feel like you just finished paying your kids' way through college. Or your adult children finally moved out of the house (phew!). You're ready to start enjoying a bit of freedom. You've finally retired and are ready to hit the golf course, or ski trails or travel like you'd always planned. Or simply lead a quiet life at home. It started with running a few errands, some minor home repairs and fixing the occasional meal. For some it gradually increased over the years and for others it changed overnight. Now you're faced with caring for aging parents who are needing more and more care - from you! You love your parents and want to do whatever they need, but you never knew it would be this much work. We can help you negotiate this unfamiliar territory! We are two health care professionals that work with elderly of every age and stage (and their adult children like you) to optimize their health, safety and quality of life. We are also watching our own parents have increasing roles and responsibilities caring for aging parents. One set of parents watch from a different city as their sibling struggles with their mother's failing health. The other set of parents helped their mother move into a senior's housing complex and have gone from helping several times per week to having to stop-in daily. We can give you the best first-hand advice on caring for aging parents. After all, we give advice about this professionally every day, and are experiencing it personally with our families as well. We wanted to share what we've learnt (and continue to learn) with others that are having these experiences. Let us help you tackle the many choices that have to be made while caring for elderly parents. Everything you need is right here. 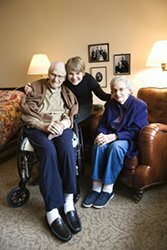 Over the years, we have been involved with thousands of families helping with their aging parents. Some families managing successfully and others frantically. Some families planned ahead so that when a health issue occurred, they knew what to do. They knew about their loved one's health, how they were doing at home and what their options were when things changed. Other families avoided and procrastinated so that the inevitable crisis occurred and overwhelmed them. It consumed their lives for weeks, months and even years. It affected both their loved ones and their health (physical, emotional and even financial). We want you to be one of the families that plans ahead and makes it as smooth a journey as you can - for both your health and your aging parents. We've seen what really works. Where ever you are at, we can help make things easier, safer and more enjoyable - for both you and your loved ones! Learn about elderly care products and equipment available to improve safety. There are lots of other ways to improve safety and even look at changing a home to be more accessible. Learn more about the aging process including disease progression, what is normal and what to expect next. Share other's experiences and stories. Reading other people's stories may help you to feel less alone (or at least feel better about your own situation!). You can also learn from other people's experiences. Learn how to help your aging parents maintain health and mobility. This is essential in keeping your the elderly as independent as possible for as long as possible. Get advice on matters big and small from choosing the right pair of shoes for your aging parent to as big as choosing the right type of life insurance.